Twitter is hard. That’s why many people don’t understand it, and inevitably choose to ignore it. I use Twitter as a marketing tool. It’s a great way to meet like-minded individuals in your niche, build a loyal following, and gain exposure for your brand. One day, this happened to me. My tweet was seen by over 150,000 people and received nearly 20,000 engagements. And it even got me featured in some very large online publications like Uproxx, NESN, and Boston Magazine. To start, let’s take a look at the tweet that went viral. One of the things Twitter is used most for is live sports highlights. Many users stream the games on their computer, and will GIF highlights and post them on Twitter for all to see. Occasionally, when I’m in the mood, I’ll do the same. I mean, I’m watching the game anyway, so why not make some interesting tweets out of it? While watching this particular game, I noticed this funny moment, made a GIF out of it, and tweeted it. I don’t have a ton of followers so, in order to have it seen by more people, I used a couple of the official hashtags for the game. It worked, to a certain degree. I had received about 50 engagements (likes and retweets) after about 10 mins. But then it tapered off, and it seemed like that’s about all I was going to get. I follow a couple of Twitter users who built a following almost exclusively by posting hockey GIFS, @peteblackburn and @myregularface. They each have tens of thousands of engaged followers. I noticed that neither one of them seemed to notice this moment from the game. They hadn’t posted any highlights of it. So, I sent it to them. And that’s when it happened. Pete retweeted it to his followers, and the tweet took off. So, what do we learn from this experience? This one should be obvious, but many are too lazy to do it. There’s so much regurgitated nonsense on the internet that when people find something unique they are dying to share it. When scrolling through one’s Twitter feed, the tweets that instantly pop out at you are the ones with powerful imagery. This is harder to do than it may seem. Mainly because emotions are incredibly subjective. Tweet things that will likely evoke emotions like humor, sadness, shock, or even anger, when appropriate. These are the types of content people like to share. In my tweet, humor was the focus. Hashtags don’t have the same prominence they once had, but they’re still important. While the vast majority of the success of my tweet came down to a retweet from a big user, I still had a good boost from the use of relevant hashtags. It always helps to have some engagement on a tweet before sending it to an influencer. It shows them that it’s worth sharing with their followers. In my example, my tweet was a funny hockey GIF. I knew two Twitter users with large followings of people who love hockey GIFs. So I sent my content to them to see if they’d like to share it with their followers. This is the most important step in this process. Without the help of Pete’s retweet, my tweet never would have gotten the exposure I felt it deserved. Don’t beg. Be polite, humble, and funny. The reality is, you can never predict what will go viral. There’s always a bit of random luck involved. 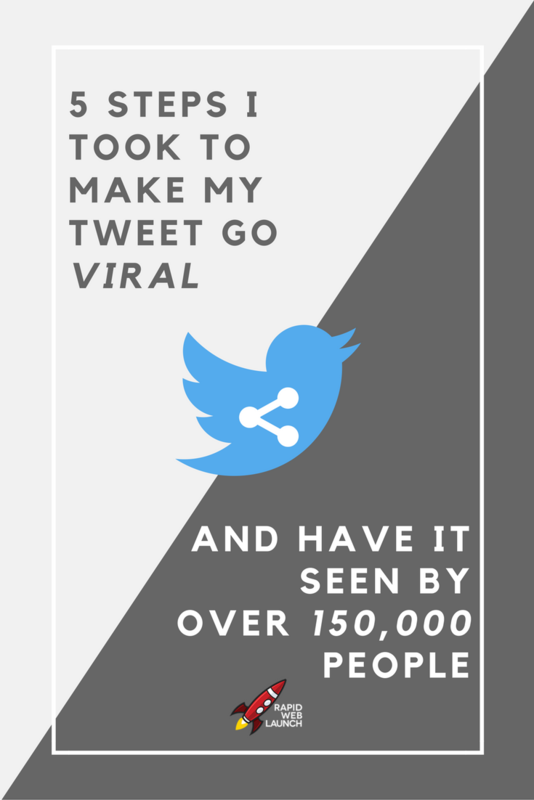 These 5 steps certainly won’t guarantee that your tweet will go viral, but they will definitely improve your odds. Measuring the true success of these viral tweets can a bit difficult. It’s true that I’m not in the hockey industry. None of these tweets have anything to do with my target market: small business web design and online marketing. It proves I know what I’m talking about when I preach to others about gaining attention on social media. I’ve gained some great back links and exposure on prominent online publications. What’s your most popular tweet ever? Send it to me in the comments!